03-09 DODGE RAM DIESEL AFE STAGE 2 COLD AIR INTAKE SYSTEM WITH PRO DRY S FILTER. Designed to work with your factory system and the AFE intercooler kit, this clamp and coupler kit feature a multi-ply reinforced high temp silicone construction. AFE 46-20010 BLADERUNNER INTERCOOLER COUPLING & CLAMP KIT. This differential cover is constructed out of durable die-cast A380 aluminum with reinforced ribs for maximum strength. This cover fits the AA14-9.25 axles. 2003-2013 Dodge 5.9L/6.7L Cummins. This cover uses Dodge Gasket P/N: 5086682AA not included. 5 out of 5 stars - 03-13 DODGE RAM CUMMINS DIESEL AFE STREET SERIES DIFFERENTIAL COVER..
1 product rating1 product ratings - 03-13 DODGE RAM CUMMINS DIESEL AFE STREET SERIES DIFFERENTIAL COVER..
AFE’s cutting edge new BladeRunner intercooler tubes are constructed of 3" mandrel bent stainless steel tubing for maximum flow then powder-coated wrinkle black for heat and corrosion resistance. Installation is a snap. "AFE Intercooler --. AFE POWER BLADERUNNER INTERCOOLERS. Quantity sold : Kit. Designed specifically for diesels ". Condition : New. Therefore all implied warranties that may apply to your part are limited to the duration of this written warranty. TheseAFE intercooler tubes for the 2010-2012 Dodge Ram 6.7L Cummins diesels are constructed of 2 3/4" Hot-Side and 3-1/2" Cold-Side mandrel-bent aluminum tubing for maximum flow. They are then powder-coated wrinkle-black for heat and corrosion resistance. We are an Authorized Dealer of Advanced Flow Engineering and carry the full line of products. MACH Force 5" Turbo-Back Stainless Steel Exhaust System w/ Black Tip for Dodge Ram Diesel. '03-'04 Dodge Ram Cummins 5.9L Diesel. AFE 46-20014 BLADERUNNER 3" INTERCOOLER TUBE UPGRADE. The AFE 46-20014 BladeRunner 3" Intercooler Tube Upgrade for your 2003-2007 Dodge 5.9L Cummins increases flow and performance in your engine. Utilizes the factory mounting locations to provide stability for a hassle-free installation. 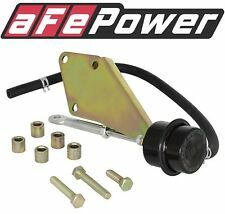 AFE Power GT Series Bladerunner Turbo Upgrade Kit. Fits 2003-2007 Dodge Ram 2500 and 3500 with 5.9L Turbodiesel Engine. 51 HP and 124 ft-lbs torque max gains, verified by AFE's in house dyno . We specialize in Auto and Truck parts and accessories. AFE GT Series BladeRunner Turbo Upgrade Kit. For 1998-2002 Dodge Ram 2500 / 3500 with 5.9L 24-Valve Turbodiesel. NOTE This item does not fit early 1998 5.9L 12-Valve Diesel models, only 1998.5 through 2002 24-Valve Diesel models. 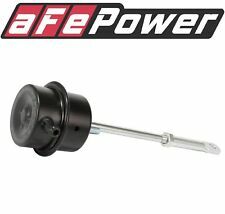 AFE has retained the factory style mounting for a quick and easy installation. 2003-2007 Dodge 5.9L Cummins. Compressor Exducer - 87 mm. Compressor Inducer - 60 mm /Trim: 48. 2-Year Warranty. In house testing produced a max gain of 10 horsepower and 28 lbs. We are an Authorized Dealer of Advanced Flow Engineering and carry the full line of products. ATLAS 5" Turbo-Back Aluminized Steel Exhaust System for Dodge Ram Diesel. This system is constructed from mandrel bent 5" aluminized steel tubing for maximum flow, increased horsepower, increased torque and reduced EGT’s. The aFe Power 3-1/2" intercooler tube represents the next generation of Diesel performance products. Flow and Performance: The intercooler tube is constructed of 3.5" mandrel bent powder-coated stainless steel tubing for maximum flow. BladeRunner Intake Manifold. BladeRunner Intake Manifold; Multiple Directional Vane Technology; 3.5 in. ; Incl. Ports For Nitrous/Gauges/Access. - 2 Tapped 1/8 in. NPT; Up To 68 Percent Flow Increase;. 2001-2016 GM 6.6L Duramax | 2003-2014 Dodge Cummins (w/ 14-11.5 Axles). Constructed from die-cast A380 aluminum, this rear diff cover will fit the AA14-11.5 rear axle found in 2003-2014 Dodge Ram 2500/3500 & 2001-2016 GM 2500HD/3500HD. Advanced Flow Engineering, Inc. (aFe) produces high flow, high performance air filters & intake systems for the automotive industry. We are a team of engineers, machinists, production and sales people who believe in the product we design.